Constantine had a fetish with Christian symbolism, placing them on weapons of warfare and going into battle. Upon his victory he said the victory was the result of the Christian symbols and the Christian God. This see the up Christianity as the religion of the state. “Almost overnight the church found itself in a chaplaincy role to the empire and on a trajectory that would lead to the catastrophe of a deeply compromised Christianity. The catastrophe of church as vassal to the state would find its most grotesque expression in the medieval crusades when, under the banner of the cross, Christians killed in the name of Christ. The crusades are perhaps the most egregious example of how distorted Christianity can become when we separate Christ from his ideas. Yet we continue to do this—we worship Jesus as Savior while dismissing his ideas about peace. For seventeen centuries Christianity has offered a gospel where we can accept Jesus as our personal Savior while largely ignoring his ideas about peace, violence, and human society. We have embraced a privatized, postmortem gospel that stresses Jesus dying for our sins but at the same time ignores his political ideas. This leaves us free to run the world the way it has always been run: by the power of the sword. Under pressure from the ideology of empire, concepts like freedom and truth gain radically different meanings than those intended by Christ. Freedom becomes a euphemism for vanquishing (instead of loving) enemies; truth finds its ultimate form in the will to power (expressed in the willingness to kill). This God of love and peace has been morphed into a God of wrath and war. Can a nation claim God’s right and just cause belongs to them and that the nation is carrying out God’s will? Thanks for posting the excerpt. This book has been on my list. 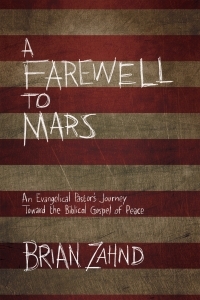 I really like Brian Zahnd’s fresh insights (which are ancient ones! ).